Sergei Bobrovsky and the Columbus Blue Jackets are heating up at the right time. Emoji Translation: Bobrovsky posted a pair of shutouts along with four wins to help Columbus to a perfect week and put them a point ahead of the Carolina Hurricanes for the first wild card spot in the Eastern Conference. His nine shutouts set a new career-high, which also currently lead the league, and leave him just one shy of tying Steve Mason for a single season franchise record. However, "Bob" has been no stranger to personal milestones this campaign after having recently surpassed 30 career shutouts and 200 wins in the NHL. Bobrovsky and the Blue Jackets squared off against the New York Islanders Tuesday night, and coming off a 5-0 shutout Sunday, the netminder made 26 saves to post his second straight shutout (and eighth of the season) in a 4-0 victory. For his efforts, which brought his shutout streak to 159:25, Bobrovsky was named the game's first star. The blanking was also Bobrovsky's third in four games. In what New York head coach Barry Trotz called "a playoff game", Isles forward Brock Nelson also noted the goalie's poise. "He's calm back there, makes a lot of saves for them," said Nelson. "With a quality goalie like that, you've got to find a way to get more bodies, more pucks there to create havoc." Bobrovsky backed Columbus to a critical 6-2 win over the Montreal Canadiens at Nationwide Arena Thursday, which tied the Habs for the second wild card in the Eastern Conference. "They gave us energy," Bobrovsky credited the Blue Jackets' fourth line of Nick Foligno, Brandon Dubinsky, and Riley Nash. "We didn't have a good start but with their work ethic, they work hard, they dragged the team into the game and gave us a chance." 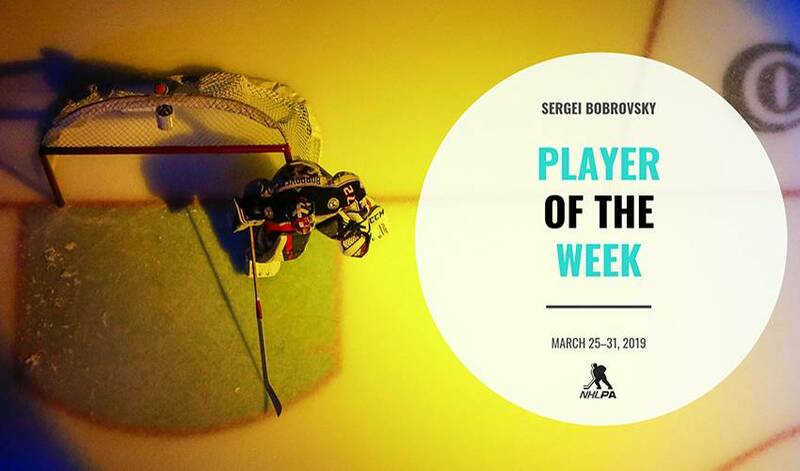 The win was Bobrovsky's third in a row. The Blue Jackets held on to their wild card positioning with a 5-2 win in Nashville Saturday night. Bobrovsky made 23 saves for his and Columbus' fourth straight win, meanwhile teammate Cam Atkinson scored the fifth and final goal of the game to tie Rick Nash's franchise record of 41 goals in a single season. With each win becoming more critical to a chance at the Stanley Cup Playoffs, Columbus took control of their game. "I just think we're clicking," Blue Jackets denceman Seth Jones said postgame. "I think we're all aware of the identity that we have to play with. All four lines are playing great hockey, controlling the tempo, controlling the pace of play, which is nice." The Blue Jackets were in Buffalo the very next night, and Bobrovsky was called upon to close out the second half of the back-to-back at KeyBank Center, where he made 38 saves for his league-leading ninth shutout this season. Bookending a week with shutouts is tough to do, but No. 72 actually accomplished the feat earlier this season when he earned his first nod for NHLPA.com Player of the Week (Dec.17-23). When questioned postgame by reporters about having three shutouts in his past five outings, Bobrovsky admitted he was grateful but just one part of a team effort. "It's nice to have. I'm not going to lie, it's nice to have it, but it's most important the team success, how the team plays in front of me and how offence, defence the whole team played. That's the biggest thing for me." Three regular-season outings separate Bobrovsky and the Blue Jackets from the postseason and they'll get back to work Tuesday at Nationwide Arena, where they'll play against the Boston Bruins in the club's last home game of the season (7 p.m. ET).